Hidden Figures is now showing in the United States and will be released in Australia on February 16. Distributed by 20th Century Fox. Like the incredible women in the film, Hidden Figures is smart, entertaining and inspirational. It's a wonderfully sharp film that provides a nostalgic and informative snapshot of history while never neglecting it's responsibility to pay the greatest tribute to it's remarkable heroines. Set in 1961, Hidden Figures is the widely unknown story of how three extraordinary women overcame the unavoidable obstacles of race and gender to assist NASA in their quest to put men in space and ultimately on the moon. 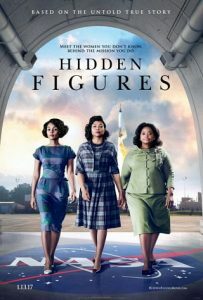 Katherine Johnson (Taraji P. Henson), Dorothy Vaughan (Octavia Spencer) and Mary Jackson (Janelle Monae), all of who were close friends, made their mark on history in each of their fields at NASA at a time when racial segregation was still in place in the state of Virginia and women still struggled to be taken seriously in the workplace. Hidden Figures is truly a marvellous piece of filmmaking by director and co-writer, Theodore Melfi. At 127 minutes, it is by no means a short film. However, it is still incredible how much it does and says in this amount of time without seeming heavy or overloaded. Hidden Figures never once loses focus of it's primary goal, which is to tell the story of Katherine Johnson, Dorothy Vaughan and Mary Jackson. Yet at the same time, the film also provides an intriguing and nostalgic historical imprint of early 1960's in the United States, a time when a great deal of interesting things were taking place. Tensions were high between the United States and Russia and were heightened when Russian, Yuri Gagarin became the first man in space. Being beaten by the Russians in such a time did not sit well with the country and especially not with NASA. "Despite what you think, I have nothing against y'all"
"I know you probably believe that"
This may look and sound like an insult, but it is not that as it is nothing but the truth. Hidden Figures contains numerous memorable and important pieces of dialogue such as this, but they can also feel as though they were included for people to comment on their importance. This may not sit well with some cinemagoers, but Melfi and Allison Schroeder have achieved their purpose as here we are indeed referring to them. Yet as much as Hidden Figures is a beautifully made historical picture, it does not forget it's primary responsibility is to highlight the ways Katherine Johnson, Dorothy Vaughan and Mary Jackson overcame seemingly impossible obstacles to achieve incredible things. The screenplay allows for the character development and in depth study of all three of the main characters so that one feels as though they are satisfied with how well they know each of the women. Not only that, but each character has their own unique personality and they have been brilliantly cast in order to make the most of their glorious character traits. Right from the first scene which the three women appear in together on the deserted road when their car breaks down, you feel as if you are already getting a sense of who Katherine, Dorothy and Mary are and they are all a sheer joy to watch in this scene. Taraji P. Henson is wonderful as Katherine in that she is restrained, but powerful. More importantly, she is relatable and completely likable. Octavia Spencer also gives a strong performance as Dorothy, who is also rather maternal not just around her children, but also over her workers. Janelle Monae is a particular standout as Mary. From that first car scene, one can tell she is the sassy, street smart one of the trio, but not in a way that is unnatural by any means or arrogant. She is great fun to watch and brings a certain sense of "cool" to the film, but in a mature and serious manner so not to take anything away from her achievements. Hidden Figures is enjoyable and entertaining, but not overwhelming. The brilliance of this is that it does not detract from the enlightening, intelligent and inspiring story of these three incredible women.